There is now a new meaning to the children's song, "The Wheels On The Bus Go Round and Round." A school bus in Lincoln, Neb., was built with a 42,000 horsepower engine and can hit a speed of 320 mph in just a few seconds - so you would never be late for school! While children would never actually ride this school bus, there was nothing stopping CBS affiliate, KOLN/KGIN-TV's reporter Chad Silber from hopping on for the ride of his life. "We are locked and loaded. I've got the fire-proof vest on all the way down to the shoes. We can't have any skin showing because just in case this puppy blows up we want to make sure we don't start on fire unless we blow up then I guess it doesn't matter," said Silber. 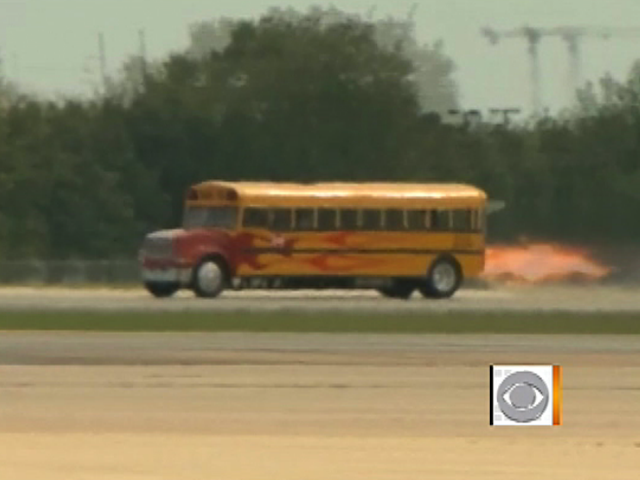 "We're about to get on this bus right here it's a jet-powered school bus. It's the coolest school bus I've ever seen. We're only going to go 200, 250, maybe 300 miles per hour so not the top speed, but I would say pretty darn fast." The jet-powered school bus is the brainchild of adrenaline-junkie Paul Stender who grew up racing motorcycles and snowmobiles. The Big Bend, Wis., native eventually became an Outlaw Sprint Car Driver - and the need for speed didn't stop there. He joined the world of jet-cars, thus creating the funny and memorable "Jet-Powered Outhouse" and the "Jet School Bus," among others. "We had a F4 engine laying around, which is a 21,000 pound thrust, 42,000 horse power engine and just built a school bus around it," Stender said. "I'm starting to get a little bit nervous," Silber admitted before the takeoff. So what made Stender ultimately decide to give a school bus that much horsepower? "We thought a bus because it would be cool and we go into a lot of schools with kids and stuff like that and we thought that would be kind of neat and plus we got three seats in there so we can give rides, too," Stender explained. "When you do a full throttle run, you hit full throttle, and then the afterburner, it sets you back in the seat with a couple G's and you just launch and before you know it you're up to 300 miles per hours, it's really a neat feeling," he said. "We're alive! We made it," said a relieved Silber. "That was so crazy. At first, when you see a plane going down a runway you go straight. But this son of a gun was like veering off to the left of the runway I thought for sure we were going over the edge and they said we went 320 miles per hour and it was crazy. You could feel like hotness on your back from the jet engine. I mean the back of the jet engine was practically right up against our back. Man, it was awesome." "The Early Show's" Betty Nguyen also reported on the jet-powered school bus in action, check out the video at the top of the story. Would you go for a ride?